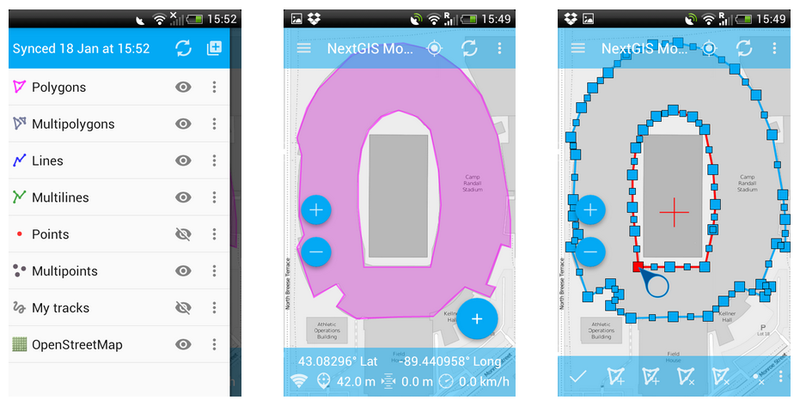 NextGIS Mobile is a mobile GIS for Android that lets you create, edit and export geodata, working both online and offline. NextGIS Mobile works on smartphones and tablets under Android 2.3 and above. display coordinates, speed, elevation etc. You can read documentation or download it as a single file (PDF). NextGIS Mobile also serves as a platform for our custom software development projects. Source code for the current version. By signing up you also get access to a full range of NextGIS products! Read more. Hi This will be a good application. I have used the application for field works. But during the visit the application crash several time. I’m using Samsung Galaxy tab 5s for this. Do You have iPhone app of nextgis? No iPhone app yet, but we’re working on it. hi,i need like this in my android app.how i can do it? what is the recommended phone for accurate data collection? You can use any phone with Android 2.3 and above. You’ll have to read up on GPS features yourself, we didn’t do any accuracy testing. Hello, I need satellite view in my app. Is it possible to implement if I use NextGIS SDK for my android project? How I get TMS or NGRC data for all the Zoom level? And also I need to show the satellite map in offline mode also. Does the app have offline collection and sync? I’m looking for an ArcGIS Online/Collector alternative, band what about field menu dropdown lists? Yes. The geodata from your Web GIS on nextgis.com can be synced with NextGIS Mobile. Offline editing is also available. Hi, on phones with high resolution, we need to zoom on the last layer (16th or 18th usually) to be able to read the details, but zooming looks for the next layer which doesnt exist. Could you implement a digital zoom on the last available layer ? Hi, there is no way to activate a camera from NextGIS Mobile running on Android 7 (in contrary of Android 6 or older) to be able to add attachment to the vector feature. Are you planning to fix it? Thanks. Hello, what’s your current version of NextGIS Mobile? Hello, the current version is 2.5.6.3 (rev. 28) running on Android 7.0. You’re way behind, current is rev. 33, please update and try again. Can we connect the Next GIS Mobile to our receiver? Sorry, but the question is too general. The answer will depend on specifics. Usually you don’t need to connect NGM to a receiver. Receiver connects to Android OS and NGM simply consumes new location provider. Hello, any idea on when this may be available for iPhone as well? Can an iPhone user still view the map on an internet browser? Yes, iPhone user (and any other) can see the Web map in the browser. NextGIS Mobile is being rewritten for iPhone currently and there is progress, but we won’t be able to provide dates. Do you know if I can successfully pair NextGIS Mobile with an external GNSS receiver? We currently use a Trimble R1 device with RTX Satellite subscription. Hello, Mobile uses location that OS (Android) provides. So, if it is possible to plug in your receiver to your device to make location provided by Trimle available to OS then yes, NGM will be able to use it. I am using free version of NextGIS Mobile. how can I view attributes of displayed features (I mean the basic “i” info/identify tool)? It’s worth to read a manual sometimes. I got it – sorry for a useless question. When I set labeling for line layer, the result is unexpected: label is placed even several times along line. I think less means more sometimes: it would be great to have an option to display label just ONCE on the line in the settings. Hi Radim, yes this is not very convenient at the moment and we have a plan to improve it. Recently we’ve added extended styling for points for example. Sign up to our plans to help us move it forward! Hello, please would love to make use of this app for a large based project, can we make a custom app taliored for the project. can we use WMS as a layer? no, not in current NextGIS Mobile. Next version will have WMS support. Error:Project :app declares a dependency from configuration ‘compile’ to configuration ‘default’ which is not declared in the descriptor for project :maplibui. We can’t help with questions like that if you’re not under support. hi. can we use a custom tile layer or implement your tile class?? your app only use OSM?? I am in need to find a GIS software where i can upload .ecw rasters and/or .tiff rasters. Yours seems ideal, at least given the possibility to use the Qtiles plugin. So I tried it. But on my machine (windows 7 PRO) it doesn’t seem to work. I have Qgis 3.6.0 “noosa” and Qtiles 1.6.0. I try to convert the view of my project into tiles and all I can do is create a folder with tiles in. No Zip files are produced ( I tried with a different machine – older Windows, older Qgis and Qtiles – and it works, but then…. I cannot open it in Nextgis! ), no single file options are working so far. How come? I need to import my rasters! Please help me out.